Performance-track power distinguishes the well-built 2009 Cadillac CTS, and its luxurious interior and creature comforts mean you'll look good and feel good at the same time. The '09 CTS suffers from limited headroom and poor rear visibility, and does not offer an optional rearview camera. Costing less than similarly equipped small sedans from Mercedes-Benz and BMW, the '09 Cadillac CTS offers equivalent power, torque, and just as much upscale comfort and luxury. A high-quality build and powerhouse engines combine to produce a true driver-oriented premium sport sedan. Power comes at a price, however, and the '09 CTS sets its sights on those looking for a luxury ride rather than top-notch fuel efficiency. Cadillac's smallest luxury sedan returns unchanged after a significant overhaul in 2008. Retaining its aggressive angular front end and oversize grille, the 2009 Cadillac CTS blends performance-style power and handling with the quiet comfort and rich materials associated with the Cadillac name. It also offers plenty of gadgets and technology to let drivers choose whether they want their ride to be effortless and carefree or sport-tuned and more interactive. 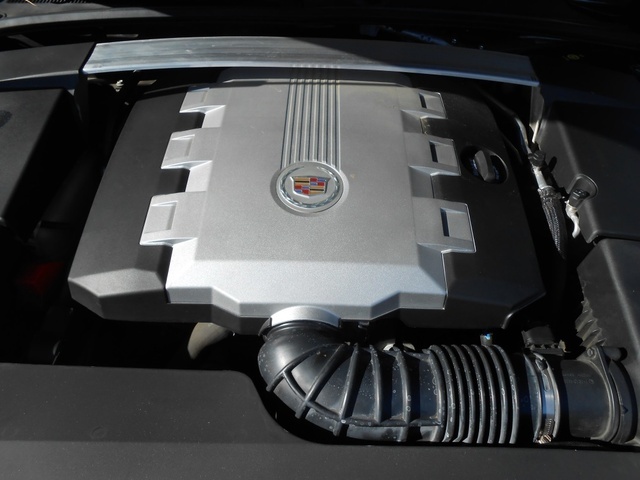 The 2009 CTS comes with either an FSI or direct injection V6 engine, with the latter putting out over 300 hp. An automatic transmission is standard, but the '09 CTS remains the only Cadillac to also offer a traditional manual gearbox, available on the FSI V6. The rear-wheel-drive sedan can be equipped with all-wheel drive, but only in sedans with an automatic transmission. The sedan rides on 17-inch wheels, with the option to upgrade to 18-inchers. All trims feature full power accessories, leatherette upholstery and trim, and a Bose sound system, but plenty of stand-alone or packaged options add upscale technology and performance features. Aimed at the high-end driving enthusiast, the CTS provides a satisfying blend of power, performance, and premium luxury, all at a cost less than those of the somewhat more refined, but certainly less powerful German brands. The 2009 CTS offers two versions of the same engine, both of which deliver quick off-the-line acceleration and plenty of energetic punch. The standard 24-valve, 3.6-liter DOHC V6 puts out 263 hp and 253 lb-ft of torque at a low 3,100 RPM, paired with a six-speed manual or automatic. A direct fuel injection version puts out 304 hp and 273 lb-ft of torque, but is paired only with the automatic. Mileage ratings for both powertrains average around 17/25 mpg, and both surprisingly require only regular gas. Test drives reveal both transmissions to be smooth, quick, and precise. Touted by one critic as a “performance masterpiece,” the 2009 CTS offers sport-like agility and a firm suspension without sacrificing passenger comfort and a silky ride. Though not as nimble as the BMW M-Series or the Mercedes-Benz C63, early test drives have wowed reviewers with tight cornering capabilities, good driver-road interaction, precise and weighted steering, and strong braking. Responsive acceleration power provides confidence in highway merging and an exciting thrill on back roads. Solid tires and dependable traction and stability control offer unbeatable road grip, and the AWD system enhances traction in slippery driving conditions. Reviewers find the handling balanced and steady, but full of satisfying driver feedback. Ride comfort stays firm, but cushioning, and wind and road noise do not intrude into the library-quiet cabin regardless of tire size. A performance package for the direct-injection V6 CTS adds a limited-slip rear differential and sport suspension, along with stronger brakes and larger 18-inch wheels with summer-only performance tires. Some test drives find these tires detract from the smoothness and high-end quality of the ride. Cadillac justifiably touts its revamped Magnetic Ride Control (stability) and Performance Traction Management systems, which use sensors to adjust grip, shock damping, and stability according to road and driving conditions. Optional for all trims, it features a more relaxed Touring mode and a firmer Sport mode, and critics find the system provides the right amount of body control without limiting the energetic driving dynamics of this sport sedan. Full of gadgets, soft leather, and driver-oriented controls, the 2009 CTS loads up on luxury and high-quality materials to provide passengers with an upscale and thoroughly comfortable ride. The cockpit-like front row, with a swooping center stack, features easily reachable and easily readable controls, including a pop-up driver information screen. Tilt and telescopic steering aids driver comfort, along with the 8-way power driver's seat. Leatherette upholstery feels soft and supportive, and passengers appreciate the heated front seats in the winter. A cooling feature is available as an option, as are an 8-way power passenger seat, driver's memory settings, and a power tilt and telescoping wheel. The 42 inches of legroom up front comfortably accommodate long-legged drivers, but the 39 inches of headroom might feel a bit pinched. Back-seat passengers receive only 36 inches of legroom, which feels adequate for short trips, but may wear out its welcome on longer drives. The rear seats do not split-fold, but do feature a folding armrest that doubles as a trunk pass-through. The trunk holds 14 cubic feet of cargo, but some critics find the opening too small for easy loading. In the cabin, a center console, door pockets, and front and rear cupholders provide minimal storage facility. Almost all manner of technology resides in the '09 CTS. Along with the requisite power windows, locks, and mirrors, and remote entry, the high-end sedan features auto-dimming mirrors, wheel-mounted cruise and audio controls, dual-zone climate control, and an 8-speaker Bose sound system with a CD player and satellite radio. Leather and wood trim adorn the wheel, shifter, and doors, while a satin metal finish outlines the gauges on the center stack. Many owners opt for extras, such as the double-paneled UltraView sunroof that stretches nearly 70 percent of the length of the roof. 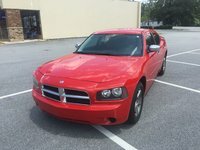 Other options include remote start, a 10-speaker surround sound system, an MP3 jack, and a retractable navigation system that features real-time traffic and weather and a 40GB hard drive. Riding in a 2009 Cadillac CTS feels safe and solid to many drivers, and the crash test scores and safety ratings back this up. The CTS earns five stars in side impact and passenger front impact tests and four stars in driver impact and rollovers. The luxury sedan comes standard with traction and stability control, which provides extra grip and balance without compromising the sedan's sporty driving dynamics. Four-wheel disc and ABS brakes get electronic brakeforce distribution and brake assist. The standard 17- or optional 18-inch tires come with a tire monitor to measure pressure. Six airbags include dual front-side and side curtain bags for both rows. However, a recall notice has been put out for the '09 CTS regarding the passenger side airbag. An easily fixable software problem mistakenly disengages the airbag. Automatic headlights, daytime running lights, and OnStar are also standard. Despite many complaints about the poor rear visibility due to thick pillars, the CTS does not offer a rearview camera, but parking sensors can be added as an option. Other safety options include rain-sensing wipers, xenon HID headlamps, and adaptive headlights that automatically swivel to provide maximum visibility on winding roads. A quick scan of owner reviews of the 2009 CTS reveal few negatives and plenty of exclamation-capped positives. Topping the list of favorites is the powerful V6 engine, with its smooth powertrain and instant acceleration. One proud owner calls the CTS a pure driver's car. The interior luxury, quality fit and finish, comfortable seats, and standard technology features also earn high marks. Drivers say they get many compliments on the exterior style, which they call bold and a head-turner. The fuel economy pleases most owners, with some claiming they get as much as 30 mpg, even when pushing the car to its limit. Other big hits include the retractable navigation screen, the AWD grip, and the easy-to-use controls. Rear visibility remains the number one complaint against the '09 CTS, along with the lack of a backup camera option. The rear headroom earns a few minor gripes from those over 6 feet tall, and several owners wish there were more interior storage. The absence of standard Bluetooth feels like an oversight in an otherwise well-equipped sedan. Few CarGurus owners have weighed in with reviews, but the positive comments echo those of other owners. 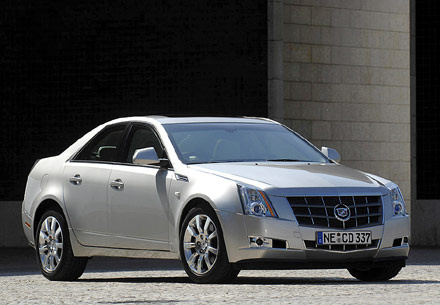 The CTS ranks high in terms of driving dynamics, performance and power, and gorgeous luxury styling both inside and out. 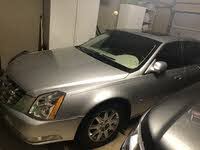 CarGurus owners of the very similar 2008 model call the CTS the best-built Cadillac on the market and love its handling, interior comfort, AWD capability, and new bold exterior looks. Like owners on other websites, they complain about the lack of Bluetooth and a somewhat cramped back seat for tall passengers. What's your take on the 2009 Cadillac CTS? Users ranked 2009 Cadillac CTS against other cars which they drove/owned. Each ranking was based on 9 categories. Here is the summary of top rankings. Have you driven a 2009 Cadillac CTS? How Many Miles Does The 2009 Cadillac Cts Last For? Looking at a 2009 cadillac cts with 174,000 miles on it for $6,700 is this too many mile for this car and this price or a good deal? 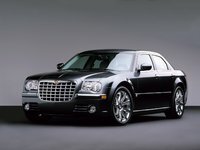 Are there any make/model cars that the alternator interchanges with 2009 Cadillac CTS? My system for heating up and defrosting the car wont turn on at all.